Considering an African safari? A good idea is to drive yourself. Here's your guide to a successful delf-drive adventure in Namibia. Spotting animals in the Etosha National Park, Namibia. 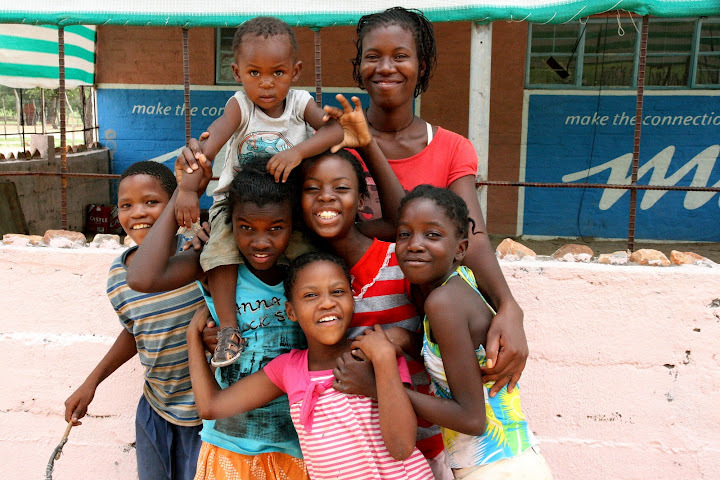 A Namibian family I met as I stopped to buy a drink. NAMIBIA TRAVEL GUIDE. Considering an African safari? There are almost as many safari operators as there are animals to watch. Many of the tour companies might seem expensive. But it all depends on what kind of services and comforts you want. 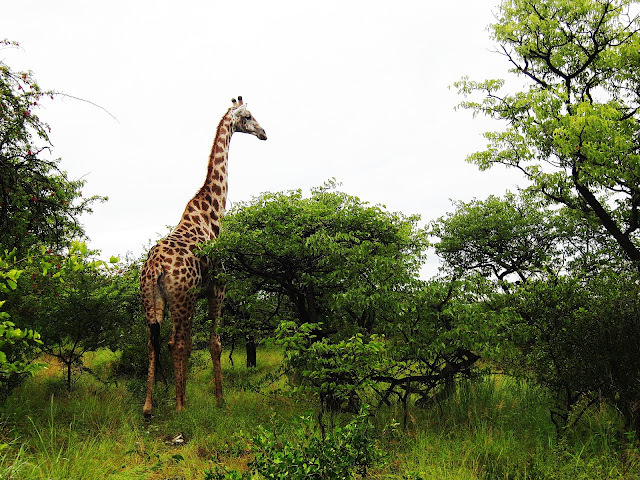 Seeing wild giraffes, lions, elephants and crocs is an extraordinary privilege, though, and it comes with the package that an African safari isn’t the cheapest of holidays. I went about the business of selecting what kind of safari trip I wanted in a straightforward manner. 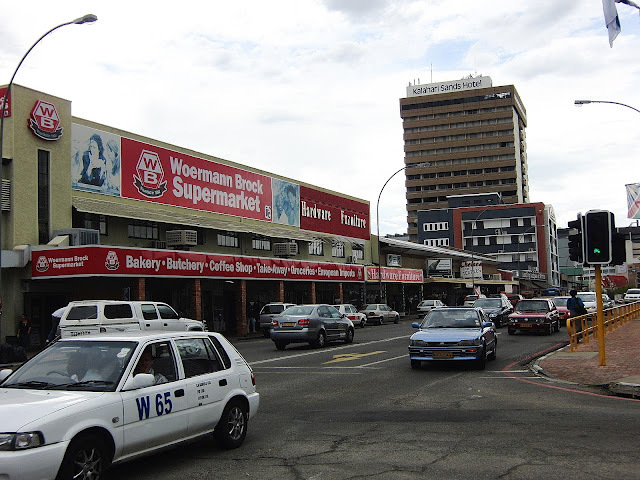 I simply bought an airline ticket to Windhoek, the capital of Namibia, and then rented a car. All without leaving the computer. Driving is fun, I thought, and my research told me that the roads in Namibia, a relatively prosperous country with a booming mining business, are of a relatively good standard. Mostly. It is necessary to get a grip on Africa to get the most out of the experience. The continent has been, and still is, haunted by more conflict zones, civil wars, neglected human rights and corrupt politicians than any other continent. That is the common official picture of Africa, and while it is true, there are many countries and regions with peace and safety for travelers. Namibia is one of those. It shares land borders with Angola and Zambia to the north, Botswana to the east and South Africa to the south and east, and became independent from South Africa in 1990. Being a former German colony, this now peaceful large country with its small population of about two million attracts large crowds of European tourists and off road adventurers. Namibia holds no less than two deserts, the Namib and the Kalahari, and numerous parks with superior wildlife. 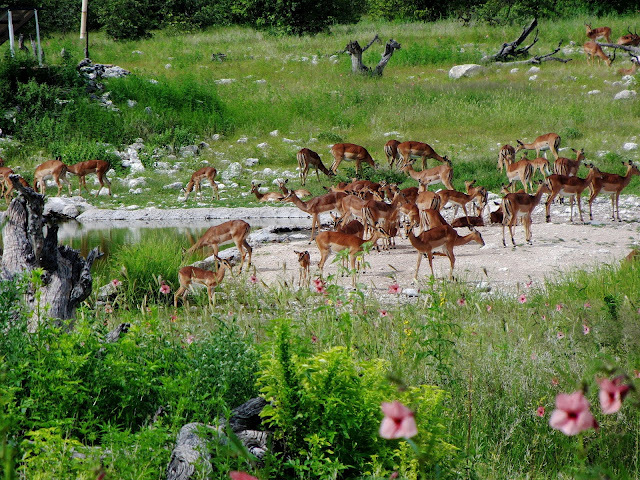 One of the best is the Etosha national park in the north. It also boasts the desolate and notorious stretch of coast known as the Skeleton Coast, where stranded seafarers have met their destiny in stormy weather on the Atlantic. My trip starts out of Windhoek, the capital (many chose to drive into Namibia from Botswana of South Africa), where I have booked a room at a nice self-catering hostel called the Rivendell. I spend two days checking out Windhoek, with its German-influenced buildings, then I pick up my rental Toyota 4WD truck and head for the coast. Namibia’s main roads are great, although with minimal shoulders. Take care while driving, as the soft sand off the road can get you into trouble. The smaller dirt roads, which you will eventually have to negotiate, are mostly of good standard, but you will have to pass small rivers and streams every now and then. The rivers are often dry, at least so it seems, but even so, a 4WD car is more or less a necessity if you want to really get close to nature. The main tourism hub in the middle area of Namibia is Swakopmund down by the Atlantic coast, a nice place to spend one or two nights at. Restaurants and shops are plenty and there is tons of things to do. 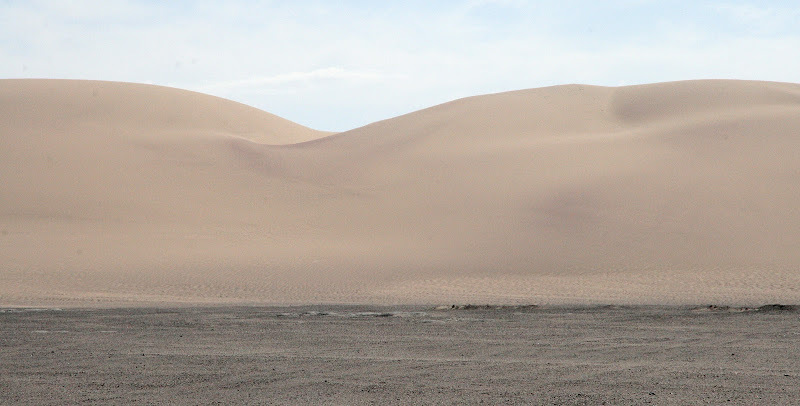 Don’t miss the chance of driving into the Namib sand dunes on a 4WD bike, which is hilariously fun. A few kilometers east of Swakopmund, the Rössing uranium mine, one of the world’s largest open pit uranium mines, is open for tours, departing by bus from Swakopmund. 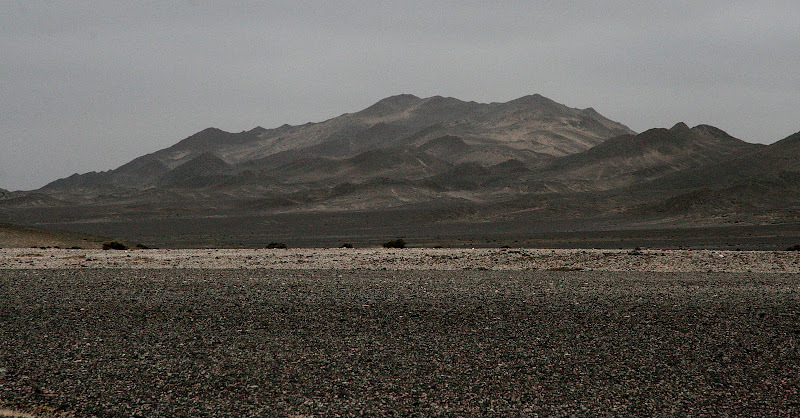 Low black mountains, or rather dunes covered with a layer of black volcanic ricks, looms in the distant. But the real adventure awaits north of the town. The Skeleton Coast is a vast stretch of empty desert land along the Atlantic coast, an area where it is necessary to have your own vehicle. The Skeleton Coast is divided into an open part, where you can drive without a permit, and the Skeleton Coast Park, where you’ll need a permit to enter. 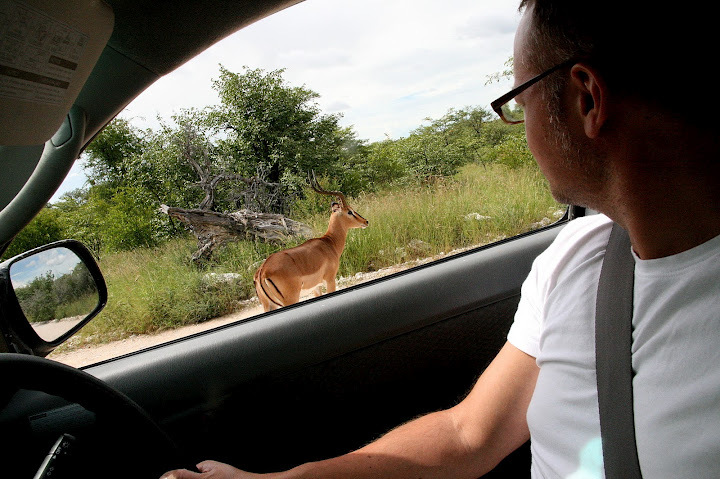 Be sure to arrange lodging and permit on beforehand in Windhoek, prior to your driving adventure. The same goes for the Etosha national park and other parks. Check your guidebook for advice. When you are driving north, don’t miss the Cape Cross seal reserve, where hundreds of thousands of the special fur seal gather. The largest seal colony of its kind in the world, it is an extraordinary sight. Watch this movie from Cape Cross. The Skeleton Coast was given its name for its grim way to handle crews that were shipwrecked off the coast. 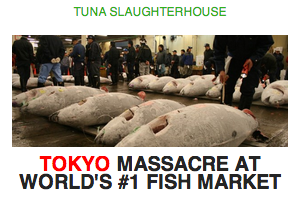 They simply starved to death in the dry, hostile environment. The drive is one of the most scenic I’ve ever done. Kilometer after kilometer, on a straight road, through salt deserts, with black mountain ranges looming in the distant as if picked out of a Lord of the Rings movie. It is a fantastic scenery, and I find it necessary to stop every few minutes to take pictures. End of the road at Terrace Bay, the Skeleton Coast, Namibia. Terrace Bay inside the Skeleton Coast Park is as far north as you’ll get by car. 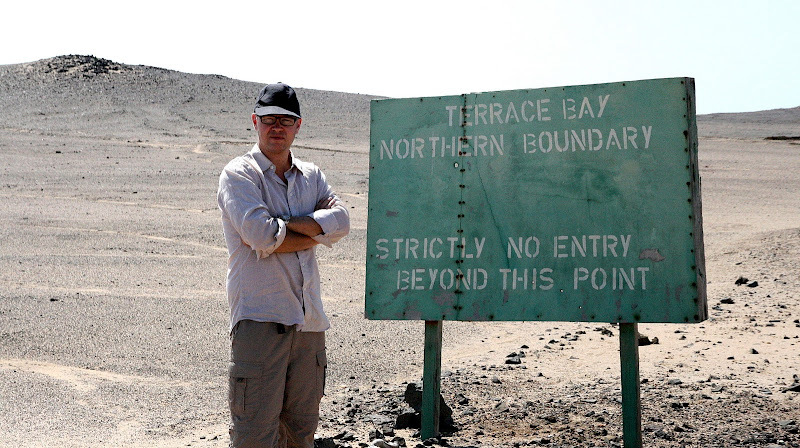 At least if you haven’t arranged extra, and expensive, permits to get into the far northern part bordering Angola. A sign just north of the bay says clearly that the land beyond is strictly off limits. Terrace Bay features a small airfield, and tourists with a generous budget may opt for renting an airplane and go looking for wild animals from above. I’m not one of those lucky, so after Terrace Bay, I head south again and take a left turn where the road divides. Exiting the Skeleton Coast on its eastern side will save you a few boring hours driving the same way back. The eastern passage will also take you more or less straight to the Etosha National Park, which shouldn’t be neglected. The park holds pretty much all wild animals there are around. It is possible to watch lions, giraffes, springbucks, elephants, an array of birds, zebras, antelopes and more. The park covers a vast area, so you’ll need at least three days to see it to a reasonable extent. There are lodging camps inside the park, and you will have to show a proof of booking at any of those when you enter the park. I get lucky as early as the first day in Etosha. As I drive through an open grass field, with a forest on the far right hand side, I meet another car which has stopped. The people inside are looking hard at an object at the border of the forest. I bring up my binoculars – don’t forget them on your trip – and watch. It is a lion. Far off, but clearly visible, it comes strolling westwards, apparently not in hunting mode. I sweep to the left and get a few buffaloes and antelopes in view. They haven’t seen the lion yet. Suddenly, as the predator comes closer, it is as if an alarm goes off. Suddenly, the animals are on guard, looking wearily towards the lion, which moves slowly ahead. It is a stunning sight. The situation develops into a standoff, with the lion clearly unable to decide if it has strength enough to engage in a hunt. But being spotted, it has lost its advantage, and finally looms off into the woods. The waitress at a coffee shop in the Namibian town of Outjo just south of Etosha, adopting a prosaic view on things, says, “There are lots of young people here with no jobs. There is not much to do. Many wants to leave the country”. Namibia may be one of Africa’s better off nations, but especially young people have a hard time finding jobs. You should take care in certain areas in the cities, as petty crimes do occur. Other than that, the biggest danger is traffic accidents. Traffic itself is slow and sparse, but do stay within the speed limit, especially on dirt roads where it is often necessary to drive slowly to prevent the car from skidding off into the fringes. It doesn’t hurt with some experience driving off road. When driving around in a wildlife park, don’t venture outside your vehicle. Etosha National Park after the rain. This is why you might need a 4WD. Self-driving is big in Namibia, but it isn’t the cheapest of holidays. More, prices don’t differ that much between rental firms, so it is rather a question of picking a rental that provides the best services and the right type of car. Most firms charge a fee per day depending on how many days you will rent the vehicle. As an example, the Asco Car Hire in Windhoek will set you back 41 euros per day for a small Suzuki Jimmy 4WD if you rent it between one and two weeks during May and July. If you want the car for more than two weeks, the daily price shrinks to 39 euros. There are loads of car rentals in Namibia and neighboring countries, all with its own specialities and services. 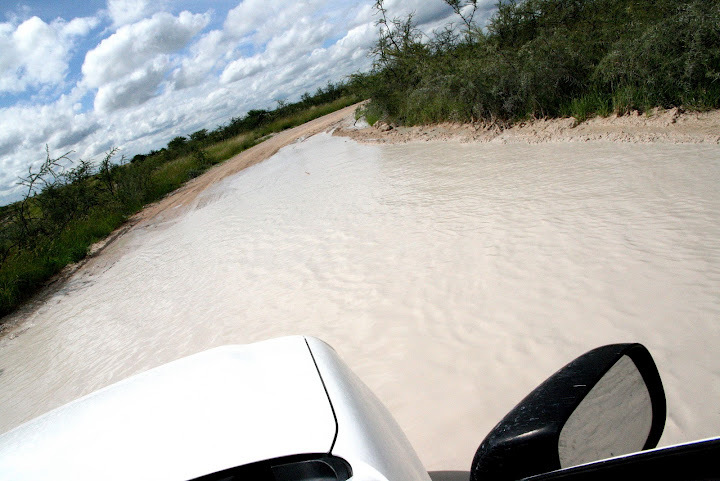 An ordinary passenger car will do on Namibia’s main tarmac roads, but you’ll need a 4WD to get close to nature, and especially during the wet season in Feb-March when heavy rains can turn normally good dirt roads into mud. Avis, Hertz, Europcar and the others are all present in Namibia, along with numerous local establishments that can set you up with camping equipment, lodging, pickups and related services. Check out the Car Rental Association of Namibia to browse alternatives. The Cardboard Box is another good site. A search for “car rental windhoek” on Google will also pretty much do the job. As an example, the Reporter went looking for round trip air tickets from London to Windhoek in september 2012, departing on the 7th and returning on the 28th. Many flights stop by in Johannesburg, South Africa, so it is possible to arrange for a couple of nights’ stay there to see the city. • South African charges 1,425 US dollars for a London-Windhoek round trip on the selected dates, with a stopover in Johannesburg. • British Airways charges 1,769 US dollars for the same journey, but with stopover in Cape Town instead. • Changing dates back and forth can shuck about a hundred dollars off the price in general, especially if you are prepared to do two stopovers. Swiss takes you from London to Windhoek via Zürich and Johannesburg for 1,360 US dollars, departing on September 5th, a Wednesday, and returning on September 26th. The editor of the Traveling Reporter works as a business news editor, and is a frequent traveler. When not doing any of that, he spends time on his boat and tries to figure out where to travel next. Two of his top destinations are the Philippines and San Francisco. Email Erik! Follow the Traveling Reporter at Stumbleupon, Tumblr, Chime In, Pinterest, Google+, Weibo, Storify, Facebook, Traveldudes, Myspace.